Eight years ago, at only 19 years old; our founder Christina Hammer, unexpectedly stumbled upon a 4 week old puppy who barely had its eyes open. Currently attending The Florida State University, Christina was in no way planning or prepared to rescue an animal when she left her dorm room that morning. But when a malnourished, black & brown, 4 week old chihuahua crawled into her lap, she knew right then that she would be welcoming a new member to her family.. & her name would be "Roxanne". During these past eight years, Roxanne would have never imagined she was anything less than a human & anything less than Christina's child. One day, the unexpected happened. Christina and Roxanne woke up like any other morning, but Roxanne wasn't acting right. She wouldn't eat, she wouldn't potty, she wouldn't even move. Christina immediately knew something was terribly wrong with her precious Roxanne. After rushing Roxanne to the emergency vet, The doctor confirmed that something was seriously wrong; their exact words were "It's not looking good". Like a brick to Christina's chest, she burst into tears at the thought of losing her beloved Roxanne. After many tests, the doctor finally found a diagnosis- a severe case of "pancreatitis" (which can quicky & easily cause kidney failure). They adamantly asked Christina what food Roxanne had in the past 12 hours.. She told them "Just a couple treats last night before bed". ...."JUST A COUPLE TREATS" a couple treats that were contaminated. 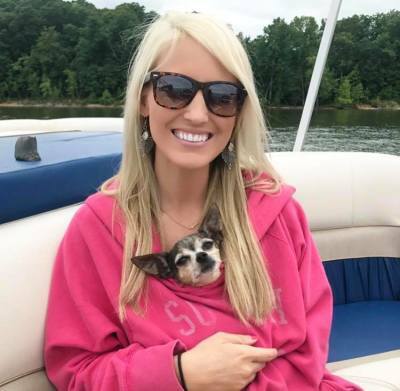 Just "A COUPLE Treats" Christina had no idea would nearly kill Roxanne. After a week in the hospital & THOUSANDS of dollars later, Roxanne was alive & on the road to recovery. The doctor told christina that she had to make extensive lifestyle changes if she wanted to have more years with Roxanne. "ABSOLUTELY NO MORE GENERIC TREATS" they said. When Christina got home, she started educating herself on pet heath an all natural treats. She was determined to make her own treats for Roxanne to ensure this would never happen to her again. So she got in the kitchen and started making them. months went by, word had spead about Roxanne's story and what Christina was doing for her & people started reaching out to Christina for treats. Surprisingly enough, everyones pets loved the treats so much, people kept coming back for more. & That is how Roxanne's Kitchen started. Similar stories like Roxanne's occur daily, however somehow these stories & this serious issue never make it to the media outlets. At Roxanne's Kitchen, we want to make sure other pets do not have to go through what roxanne did. We believe that every pet, young and old, deserve healthy treats and a healthy life. “A pet is the only thing on this earth that will love you more than it loves itself."